King Street has gone to to Motor City, to the land that spawned Detroit techno and DJs such as Derrick May, Carl Craig, Jeff Mills, Juan Atkins and Kevin Saunderson. This was also the home of DJ Terrence Parker, where from his humble beginnings doing on-air mixes for a local station in Michigan, he's gone on to do some original productions and remixing many indie and major artists alike. Terrence has released on labels such as Planet E Communications, Defected, Nervous, King Street and many more and has appeared on TV programs like the Love Parade Special (Germany) and AMP's DEMF Special 2001 MTV2 (USA). He was also featured in The Guinness Who's Who of Rap, Dance & Techno, USA The Rough Guide To House Music and others, and has played at just about every club and festival on the planet. 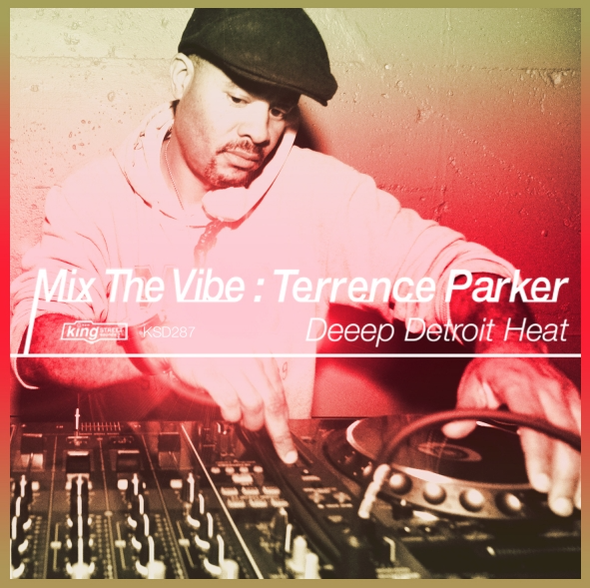 Terence now joins the family of house producer/DJs who have graced one of the longest-running series in house music, Mix The Vibe. Now on the 20th Edition, Terrence joins David Morales, Louie Vega, Tony Humphries, Kerri Chandler, Shinichi Osawa, Danny Krivit, Joe Claussell, Frankie Feliciano, Cevin Fisher, Doc Martin, Osunlade, Dj Spinna, Mr. V, Ron Trent, Peter Rauhofer (Club 69), Lord G, Quentin Harris, DJ Spen & Teddy Douglas and Dj Pierre. Culling 18 classic King Street tunes and a bonus continuous mix included in the purchase of the full album, it features tracks such as Rain / a Lil Louis Painting ‘Give It Up (MAW Flute Instrumental)’, Blaze pres. UDAUFL ‘We Are One (Kiko Navarro Viva UR Dub)’, and Groove Box's ‘Cassio's Theme’. He also revamps tunes like Kerri Chandler ft. Treasa ‘Diva’, Fennie's ‘Heal My Heart (TP Re-Edit)’, Tears of Velva's ‘The Way I Feel (TP Deeep Detroit Heat Re-Edit)’, and Less Hate and Jerome Robins' ‘Empty" (TP Re-Edit)’. The compilation has a few newer track too, such as Apollo 84 feat. Maxine Hardcastle's ‘Words That You Say (Jamie Antonelli Remix)’ and Man Without A Clue's ‘I Got A Funky Vibe’.